One merit of the wonderful production is also to overcome the separation of “high” art and circus arts, realising the aesthetic potential within the spectacular: [...] In Mauricio Kagel’s ›Variété‹, the artistes are impressive in a choreography which could not be bolder: as artists. 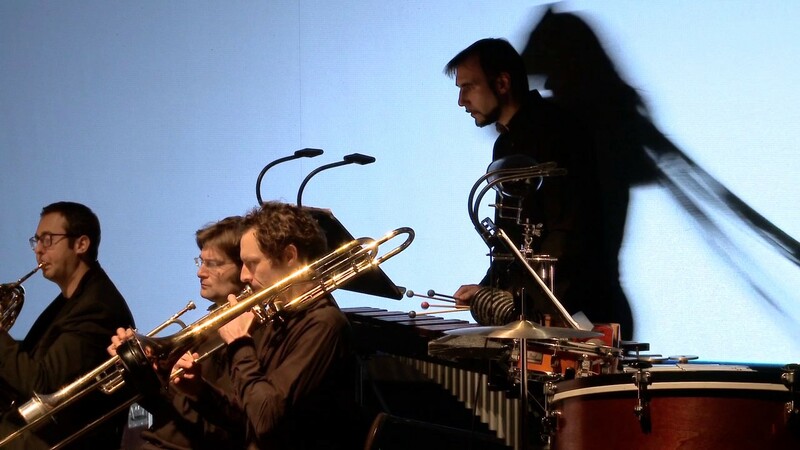 heim.spiele – Ensemble Modern@Bockenheimer Depot takes place at the invitation of and in cooperation with the Frankfurt Opera. Part of heim.spiele, a project of Ensemble Modern generously supported by Kulturfonds Frankfurt RheinMain, the Hessian Ministry for Science and Art, Aventis Foundation, Deutsche Bank Stiftung, Ensemble Modern Board of Patrons e.V., Crespo Foundation, Dr. Marschner Stiftung, Stiftung Polytechnische Gesellschaft Frankfurt am Main, Society of Friends of Ensemble Modern and the City of Frankfurt. In a sombre, pessimistic world of increasing electronic isolation, a nostalgic festival celebrating encounters and diversity (cabaret) instead of fearing them becomes a refuge and distraction – or even a way out? The evening ›Spectacle Spaces‹ with Ensemble Modern and a high-carat group of international cabaret stars and artistes impressively juxtaposes contemporary music and modern circus arts. The point of departure is Mauricio Kagel’s ›Concert-Spectacle‹ for artistes and musicians which reverses the rules of classical cabaret: the music is not random accompaniment for staged attractions; instead, it determines the cabaret programme according to musical criteria. Taking this as his point of departure, the Argentinean composer Martin Matalon has created a new composition which will have its world premiere on this evening. His music is constructed like parts of a puzzle with different geometry, colour, form and temporality, enabling the dancers and acrobats to interact as a counterpoint and projection of themselves. In ›Spectacle Spaces‹, the Ensemble Modern musicians become a central and integral part of the artistic overall concept, based on the two scores. The contrast between contemporary music and astounding, entertaining cabaret arts is dissolved in a playful manner, questioning the borders between genres and formats: a spectacular evening full of enriching contrasts.